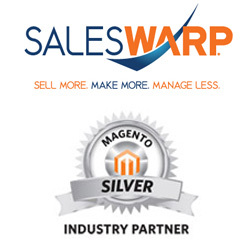 SalesWarp, a unique web-based Storefront Management System that helps retailers simplify E-commerce operations, announced they are hosting a webinar on Thursday, September 20, 2012 at 12:00 pm EST to help retailers “Crush The Competition With Advanced Storefront Management”. In today’s E-commerce marketplace, merchants need a system that can improve time-to-market, streamline operations and be scalable. David Potts (CEO & Founder) and David Anderson (VP of Marketing) will discuss how having a storefront management system that integrates all of your E-commerce operations into one system is essential to a retailers success. How to integrate your back-end operations (warehouse, ERP, fulfillment) with your Magento store, other shopping carts and online marketplaces (eBay, Amazon and Buy.com) to improve performance and reduce the need to use multiple systems. How an intelligent product management system will give you the edge over the competition in terms of price, product mix and market reach. How consolidating order, customer and product data into one system eliminates redundancy, reduces errors and improves overall efficiency. How automation not only improves time-to-market and increases sales, but reduces operating costs –resulting in a higher E-commerce ROI. SALESWARP, developed by 6th Street Commerce, is a Storefront Management System designed to help retailers manage products, orders and suppliers across one or multiple stores by simplifying online operations to increase sales, reduce costs and improve overall quality.